Description: Kids 9 & up with adult reading partner, pick up a copy of Starry River of the Sky by Grace Lin in the Children's Place. We'll get to Skype with the author at the book talk! Join us for lively discussion, a fun activity and snacks! This month we are reading Where the Mountain Meets the Moon by Grace Lin. Ages 9-12. 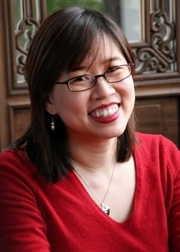 Grace Lin, "Starry River of the Sky"
Grace Lin is the award-winning author and illustrator of Where the Mountain Meets the Moon, The Year of the Dog, The year of the rat, Dumpling Days, and Ling & Ting, as well as picture books such as The Ugly Vegetables and Dim Sum for Everyone! Grace is a graduate of the Rhode Island School of Design and lives in Massachusetts. Cross-Cultural Crafts - Come Fly a Kite! Our cross cultural crafts workshop in March will be all about kites. The sky's the limit when it comes to styles of kites and Kite Flying. Kites are flown in countries all across the world (including Japan, Greece, Chile, and Singapore) as a way of celebrating different special days and occasions, and we'll be talking about that as well as looking at different amazing kites. We are providing supplies so that everyone can make a sturdy, take-home kite at this workshop - so we are asking participants for a $7 activity fee. But you will have a kite to take home and fly when you leave. After story time and snack, of course! Spaces are limited, so please email kids@bkwrks.com early to reserve your slot in this fun workshop! Grace Lin here with her new book Where the Mountain Meets the Moon. Grace Lin , Where the Mountain Meets the Moon. Grace Lin is the author and illustrator of more than a dozen picture books, including THE UGLY VEGETABLES and DIM SUM FOR EVERYONE! Grace's first children's novel THE YEAR OF THE DOG was released with glowing praise. While most of Grace's books are about the Asian-American experience, she believes, "Books erase bias, they make the uncommon everyday, and the mundane exotic. A book makes all cultures universal." See more about Grace and her work at www.gracelin.com. Grace Lin is currently considered a "single author." If one or more works are by a distinct, homonymous authors, go ahead and split the author. Grace Lin is composed of 5 names. You can examine and separate out names.